Spring is the ideal time to raise new plants form seed. It is easy, rewarding and doesn’t necessarily demand lots of equipment. Both pellets of compressed peat that swell into small pots and cubes of rockwool in plastic trays are popular at the moment but they take up a lot of space and have a tendency to dry-out very quickly. Unless you have a greenhouse and can keep an eye on your seedlings every day, these are not the best solution. Commercial growers use plastic trays with small compartments, known as cells. Versions of these plug trays are now available to gardeners but, again, the disadvantage is that they dry out very quickly. Traditionally seeds have been sown in seed trays and pots. This is still the simplest and most efficient way to raise plants from seed, especially where space is limited. A typical seed tray can be used to grow lots of seedlings. Too many, in fact, for most gardeners. Even a half-sized seed tray can hold about twenty seedlings of a perennial plant such as Astrantia major, or three times as many seedlings of an annual such as marigold. If you don’t need to raise large numbers of plants, sow seeds in 4inch to 5inch pots. Think carefully about the size of tray or pot to use. A large container will waste compost, space and seed, but too small a container may result in seedlings being overcrowded and dying. Old trays and pots can be recycled for sowing, but wash and scrub them clean first. Some plants develop long roots and should be sown in deep pots. These range from hinged plastic modules with grooves to force the roots downwards to unfussy biodegradable tubes. Sweet peas, early sowings of beans, and tree seeds all benefit from being sown in these deep pots (often called long toms). Professional growers spend a great deal of time and energy mixing composts, often using different mixtures for different seeds. Combinations of peat, loam, grit, bark, sand and leaf mould are used, and many nurserymen guard their recipes with the same vigour as Michelin-starred chefs. For sowing seeds at home the palaver of following a recipe and mixing your own compost is unnecessary: general-purpose seed compost from a garden centre is ideal. Ready-mixed seed composts are all fine-textured and low in plant food. The fine texture enables continual contact between the compost and the seed, essential for germination and seedling growth. Seed composts do not contain plant nutrients: rich composts, with high levels of fertilizer, will either kill your seedlings or cause them to grow tall, straggly and unable to support themselves. We use seed compost that is a mixture of loam (sterilised garden soil), coir (the fibre from coconut husks) and Perlite (granules of volcanic rock). Overfill the container with compost, paying particular attention to the corners of seed trays. Remove the excess compost with the side of your hand or with a flat piece of wood. Gently firm the top of the compost flat to about 1/4inch below the surface of the container. Use a specially-made compost presser, a shaped piece of polystyrene or the bottom of an empty tray or pot. Don’t push too hard as this will compress the compost. Compacted compost will inhibit seed germination and seedling growth. All you are trying to do is create a smooth, level surface to sow seeds onto. Before you sow, the compost needs to be gently watered using a watering can with a fine rose. Alternatively, soak the container in a shallow tray of water until moisture percolates to the surface of the compost. Sow the seed directly from the packet, tapping lightly on the packet to release the seed, or from the palm of your hand. The line that runs across the top of the palm is a useful groove to run seeds down onto the compost. If you are using seed trays, sow in lines along the length of the tray, turn it 180°, and then sow again in lines along the breadth of the tray. This gives an even distribution of seeds. If the seeds are large, lay them individually on the surface of the compost. The vast majority of seeds need to be covered with a thin layer of fine compost. Check the instructions on the seed packet for those few genera that prefer to be left exposed to the light. In general the seeds should be covered with a layer of sieved compost to about twice the thickness of the seed. If you don’t have a sieve, rubbing compost between the palms of your hands over the seed tray should produce fine compost. Label the container with the name of the plant you have sown and water it. There is no room for clumsiness when it comes to watering seeds. If you are not careful you could ruin the work you have done so far by making indentations in the surface of the compost or even washing seeds away. Use a fine rose on the end of the watering can’s spout (brass roses give a finer spray than plastic ones). Turn the rose upwards and move the watering can from side to side over your pots or seed trays to water evenly and thoroughly. The seeds of most perennial plants take up to a year to germinate, during which time containers will become covered with liverworts, moss and weeds, all of which can prevent your seeds from germinating, or smother the seedlings as they emerge. A layer of fine horticultural grit over the surface of the compost will hold back most mosses and weeds. Once your seeds have been sown you need to find a place to store them. The perfect environment is somewhere that does not have huge fluctuations in temperature and that is light but away from direct sunlight. An unheated greenhouse or coldframe is ideal for most seedlings, or next to the window of a garage or shed. Inside the house, the spare room with the central heating turned down works well. The place not to keep your seed trays is on the often-recommended kitchen windowsill. The warm, moist atmosphere produces leggy seedlings that are liable to rot away. Once you have found the right place all you need to do is to make sure that the compost does not dry out, and wait for the seed to germinate. The speed at which seeds germinate varies from plant to plant. Some annual and vegetable seeds germinate within a week while some perennial seeds will wait for two years before showing any signs of life. In most cases these first signs are two small leaves pushing through the surface. These leaves, called cotyledons, are there to produce more energy for the seedling to continue growing. The plant’s true leaves appear after the cotyledons. Seedlings grown in containers need to be transplanted into larger containers as soon as they have developed a pair of these ‘true’ leaves. The job is known as ‘pricking out’. Before starting to prick out, prepare small pots or module trays filled with a potting compost. Push a pencil or a widger (a special tool for scooping out seedlings) into the compost underneath each seedling and ease them out, keeping as much compost around the roots as you can. Hold the plant by one of its leaves: if you damage a leaf another will grow but if you damage the stem it’s the end of the plant. Make a hole in the compost in the new container with a pencil or a dibber (another nifty little tool specially designed for the purpose) and place the seedling into it. The seed leaf should be level with the surface of the compost. Use your pencil (or dibber) to gently push compost around the roots of the plant. Water the seedlings after they have been transplanted. Seedlings pricked out into small individual pots. 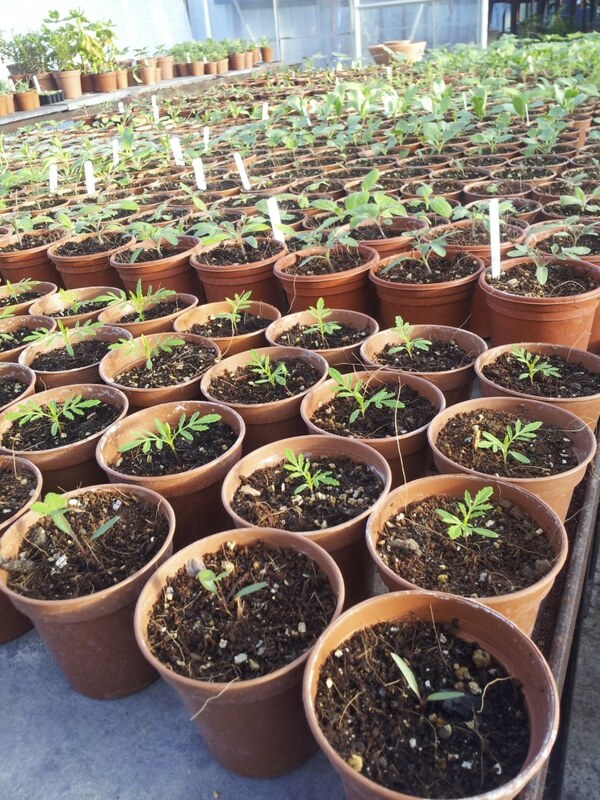 Seedlings that have been mollycoddled in a cold greenhouse or spare bedroom need to adjust to the rigours of life in the garden before they can be planted out. Stand the plants outdoors during warm days but cover them with horticultural fleece, or bring them back inside, at night. Tender plants should not be left outside nor planted in the garden until the danger of frosts has passed. The usual time to sow the seeds that you collect is the Spring. Some seeds, though, have a very short shelf-life and very quickly loose their ability to germinate. Hellebore seed should be sown as soon as you’ve collected it; wait until March and very little of the seed will germinate. Most umbellifers (members of the same family as cow parsley) germinate more successfully when they are sown in the same year that they have been collected. Primrose seed doesn’t store well either and should also be sown as soon as the seed is ready.